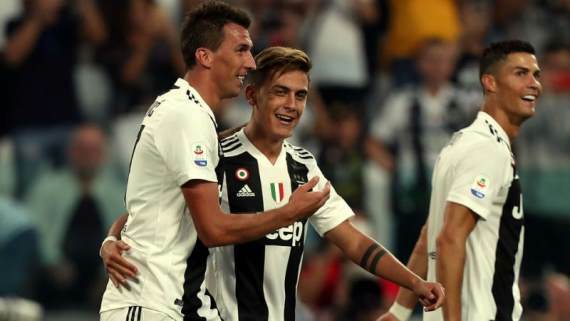 Reigning runaway champions Juventus have kicked off the season just as planned. Seven wins on the trot and that form doesn’t look likely to die down anytime soon. Napoli, Fiorentina and Inter Milan make up the UEFA Champions League places but have next to no space for error with title-rivals and challengers breathing down their necks. But let’s keep the chatter to a minimum and get down to business with round eight. After three games without a victory, Torino returned to winning ways with a hard-fought 1-0 victory at Chievo last time out. Frosinone are second from bottom of the log, winless with six losses from seven matches, scoring just once and conceding 18 times. This one is straightforward. Go with the home side, but at 3/10, it’s a bit short for my liking. With that being said, the (-1) Handicap on Torino offer decent value at 17/20. Cagliari have managed just one win from seven games, scoring just four goals. They were soundly beaten 2-0 at Inter Milan last time out but will be confident in getting a positive result against Bologna on Saturday evening. The latter have won two of their last three games but are winless on the road and are yet to score a goal on their travels. Four of the last five meetings between these sides have produced Under 2.5 Goals – follow the pattern and get on at 6/10. Udinese have been poor of late with consecutive defeats and to make matters worse, come up against table-toppers Juventus. The Old Lady are yet to drop any points and will come into this contest on a high after thrashing Napoli 3-1 at home. Juventus are buzzing and I’m backing them to rip Udinese apart in both halves on Saturday. Get on the Away to Win Both Halves – Yes – market at a generous 19/10. Relegation-threatened Empoli have lost three of their last four matches and have scored just five goals in seven games. Roma are on the up with back-to-back wins, scoring seven goals and conceding only once. The Yellow and Reds seem to be finding some rhythm and momentum and will be looking to maintain that form, while breaking into the top four. The away team is tipped. Genoa have been in great form with three wins from their last four games and find themselves just off the European places. Parma have been just as good of late but will find the going tough against the Red and Blues, who have won all three of their home games. It’s all pointing in the way of the home team but I have become a fan of Parma’s style of play and I feel they might just be able to keep the hosts at bay. The sides are tipped to share the spoils. AC Milan are unbeaten in their last five matches and will be confident in building on their impressive 4-1 victory away to Sassuolo last time out. Chievo have been deducted three points and fined €200,000 for false accounting. The Italian Football Association sports tribunal found Chievo guilty of adding around €27 million to the real transfer fees of promising young players from Italian lower-league club Cesena between 2015 and 2018. This has left them bottom of the log without a victory. Back AC Milan on the Halftime-Fulltime win at 8/10. Atalanta’s price is pretty short considering they have managed just one win from seven games and are only two points adrift of safety. Sampdoria have lacked consistency but have still been better than La Dea. They pulled the double over Atalanta last season and look a good bet to continue that dominance here. Back the Blue-Hooped on the Win/Draw Double Chance at 13/10. Lazio’s run of four consecutive victories, scoring eight goals and conceding just twice came to an end last weekend with city-rivals Roma winning 3-1. Fiorentina are third on the standings but have been inconsistent in recent weeks. The last encounter between these sides ended in a seven-goal thriller with Lazio claiming a 4-3 victory. Another goal fest looks likely, so take Both Teams to Score – Yes – at 7/10. Napoli will need to pick themselves up after last week’s 3-1 defeat at log-leaders Juventus. Prior to that loss, they had won three on the spin. Sassuolo were humiliated at home last time out with AC Milan humbling them 4-1. The Blues have been firing on all cylinders and I’m expecting them to get a couple of goals here. Back Napoli to Score in Both halves at 17/20. SPAL have been dismal with three losses in a row, scoring just once and conceding seven goals. Inter Milan have won four of their last five games, including three on the bounce. The form of both these teams speak for themselves. Get on Inter Milan to come away with maximum points.